Forget bunk beds: These “posh-tele are high-style havens. Located on the island of Giudecca, Generator hostel venice is molto Italiano. The exterior exudes the charm of yesteryear (it’s located inside a 19th-century grain house). Beyond the front door are original wooden beams, worn metals and cozy seating. Bask in live music, art shows and an antique replace from Verona, and at the cafe, mangi on Venetian- style tapas and basta pasta. From $45. 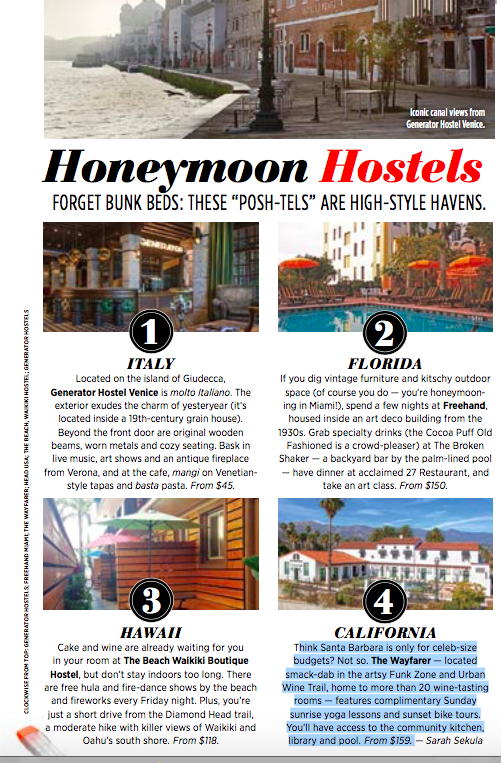 If you dig vintage furniture and kitschy outdoor space (of course you do — you’re honeymooning in Miami! ), spend a few nights at Freehand, housed inside an art deco building from the 1930s. Grab specialty drinks (the Cocoa Pu Old Fashioned is a crowd-pleaser) at The Broken Shaker — a backyard bar by the palm-lined pool — have dinner at acclaimed 27 Restaurant, and take an art class. From $150. Cake and wine are already waiting for you in your room at the Beach Waikiki Boutique hostel, but don’t stay indoors too long. There are free hula and re-dance shows by the beach and reworks every Friday night. Plus, you’re just a short drive from the Diamond Head trail, a moderate hike with killer views of Waikiki and Oahu’s south shore. From $118. Think Santa Barbara is only for celeb-size budgets? Not so. the Wayfarer — located smack-dab in the artsy Funk Zone and Urban Wine Trail, home to more than 20 wine-tasting rooms — features complimentary Sunday sunrise yoga lessons and sunset bike tours. You’ll have access to the community kitchen, library and pool. From $159.